Best Project! Madrid Local Award. And Global Finalist! Smart bins, something more than just trash. We are honoured to present to you jusTrash. 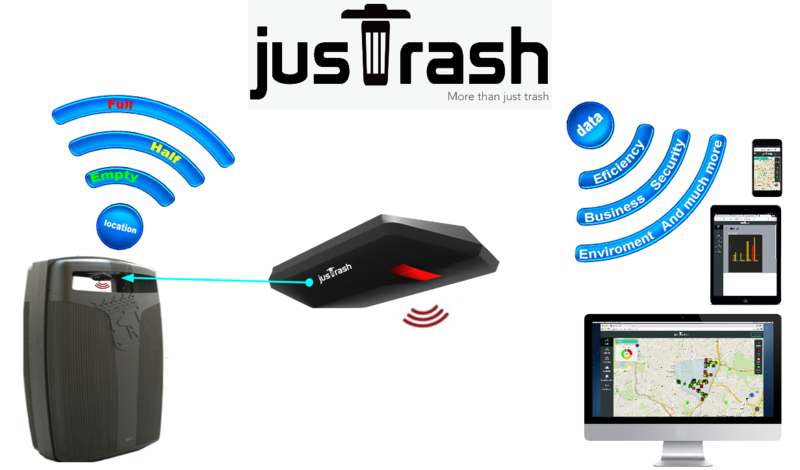 jusTrash offers cities an efficient and smart way to collect trash, enabling it not only to save money and help the environment, but to collect really valuable data to help cities get smarter, and allow better decision making. Our system uses sensors to see how full a trash can is. Whenever someone throws something into the trash can, an update is sent to our servers. The client can then access the data from our web service, and obtain the most efficient pick up routes, district by district. The settings of our sensors can be customised to fit a city’s, and the admin can decide when he wants a trash can to appear as full. Also, in a gamification concept, the different administrative organisations can be encouraged to accumulate points through keeping bins at half of its storage, which means it is being efficient enough, instead of leaving them full (which means there are not enough) or empty (which means there are too much, what is an over waste of money). The idea is to use small Bluetooth LE devices, installed on each trash can, with an infrared distance sensor on it. The different devices placed all over the city, would communicate with main repeaters or between themselves, so there’s no need to bring Internet connection to every single trash can. They would be powered through small, easy to replace batteries, which would last for quite long thanks to the use of low consumption components, such as the Bluetooth nRF8001 integrated circuit. All the data is sent to a IBM Cloudant database, where data is organised, and easily accessible through HTTP requests. The application is able to trace efficient routes through the different trash cans (thanks to the Google Maps API), and also separates them in districts (through intuitive CartoDB maps). Now.. this smart route collection system is already available for containers, but why stop there? Our system can be used for both. but, WHY stopping THERE? At jusTrash, we take data seriously, because as we like to say, this much more than just trash. With our system you can access real time data district by district, as well as a timeline of all past data. This enables a city to have more accurate population density studies, as well as know how human activity affects the environment, allowing to make wiser decisions. You can see how demographic rates (such as growth rate) affects the environment by district, which enables a city to take more precise action. Think about business location, security, urban planification, and much much more.The possibilities are endless with all this data.